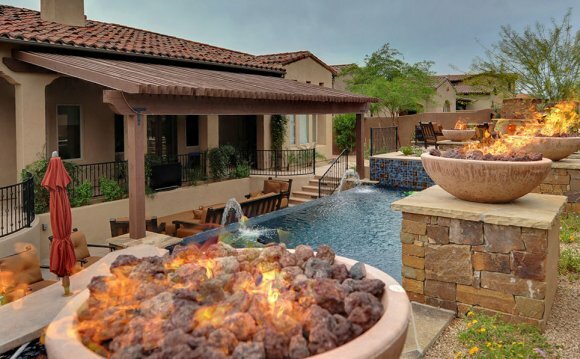 At Dream Retreats Landscape Design, we have been recognized as one of the best Chandler Landscape design companies in the phoenix area. One of our favorite areas to perform landscape design services is in Chandler, AZ. The city of Chandler has always been family friendly and about getting outdoors. And after all the activities of the day, Chandler residents just love to relax in their backyard landscape design. Dream Retreats has contributed many outdoor barbeques, pool decks, tile pavers, and other outdoor living enhancements. Chandler landscaping consists of providing homeowners a spectacular backyard landscape design. Our customers love working with us as we specialize in creating custom outdoor living spaces by combining fun and exciting features like: pools and pools slides, turf and putting greens, as well as helping in the functional aspects of outdoor living kitchens, fire pits, and barbeques. A Chandler landscape involves bridging beauty and entertaining to create backyard landscapes that are truly unique to each customer. From the initial landscape design layout to the finishing touches, our team provides you with the highest level of customer service and workmanship to ensure your new backyard landscape will give you many years of enjoyment. We create a beautiful backyard landscape design that is just right for you. Be sure to check out Dream Retreats for your next Chandler landscape design. We love to work in one of the most beautiful cities in the Phoenix valley, Chandler Arizona. We come to your home to discuss your ideas, desires, budget and individual characteristics of your Chandler landscape project.